Home » Survival Mindset & Inspiration » Are You Addicted to Prepping? A couple of years ago, my pal George Ure and I wrote this little eBook. The message is timeless and it ties in nicely with today’s article. I just know you will enjoy it. Bargain Bin: Today I share a mixed bag of items, including a few of my favorite books. One Second After: For many, the novel “One Second After” was a game changer that convinced them of the need to be prepared. I did not realize until now that the price for the Kindle version was only $2.99. If you have not read this book, you really should. Lighten Up: Love What You Have, Have What You Need, Be Happier with Less: The first Peter Walsh book I read was It’s All Too Much: An Easy Plan for Living a Richer Life with Less Stuff and I have to tell you, it inspired me to get rid of the clutter in my life and to start focusing on the things that really mattered. His latest book, Lighten Up, is more of the same and truly an inspiration. Great reads for about $10 each and especially good if you feel you have fell like you are hoarding rather than then prepping. Holding Your Ground: Preparing for Defense if it All Falls Apart : An instructional guide and planning tool that addresses defensive preparation of a location. If the government can no longer protect your home, farm or property, Holding Your Ground will teach you how. 550 lb. Type III Nylon Paracord: I wish I had known about Paracord years ago. With a recent price reduction to less than $8.00, there is no reason not to have a few hundred feet around your home, in your car, and in your bug out bag. 2. Place the flint on ground at about 45° and 2.5 cm from the magnesium powder scraped just now, then scrape the flint fast to produce spark so as to light up the inflammable material. 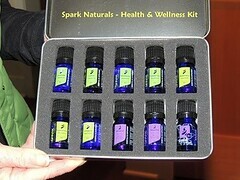 I use essential oils from Spark Naturals for wellness purposes. My recommendation is you are just getting started is the Health and Wellness kit which includes all of my favorites or, if you are just getting started, the Essential 4 Pack which includes Lavender, Lemon, Melaleuca (Tea Tree) and Peppermint. Be sure to use the discount code “BACKDOORSURVIVAL” to receive a 10% discount. Gaye, I think great minds think alike. I am ready to start enjoying life. I think I have everything in place that a reasonable person would have. I am trying to get rid of my goats and pigs that have to be fed daily, but I can load up the feeders for the chickens and rabbits, so I can bug out for a long weekend. I think I am becoming a hoarder, so I am quitting. As soon as my garden is in, I am taking off to enjoy retirement. Visit people that I miss. Thanks for giving me the ok to do that. I was storing water in juice bottles, until my sis came down for a visit. She accused me of being a “hoarder” like the people shown on TV. I told her that if she would get me a 5 gallon water dispense and a couple of bottles of water for it then I would stop collecting water in juice bottles. She got me a water cooler that also has a water heater (great for re-hydrating MH freeze dried foods) and it has a small refrigerated compartment, plus 3 water bottles for it. I feel that the TV program about “hoarders” (which I have never seen) makes many people not prep for fear they will be labled the derogatory term of hoarder. That program was a big dis-service to peppers everywhere! (Even FEMA recommends prepping!!) And, yes, I know that technically prepping and hoarding are almost the same thing, but hoarding has too many bad connotations attached to it. I don’t think you can or ever, or should stop prepping. I guess I am addicted because I want to have an easier life WSHTF. 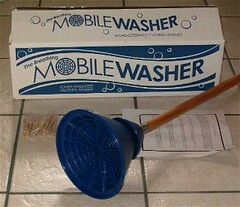 With prices going higher & higher, I feel I’m also just buying things on sale for use later if nothing happens. We can always do better at everything we do. There may be a slow down of course. However I can honestly say yes to all your questions above. For instance, Sat. we were driving by a dollar store that has some great wine glasses. 🙂 While there I purchased some more candles and lighters. Most people wouldn’t think of doing that. If that makes me a “Hoarder” because I already have some, so be it. When you are constantly aware of what you will be needing, it just becomes second nature. I’m still canning and while I have a good storage of food & items, I feel I will be the one to help take care of the rest of my family. If I have the opportunity to purchase or grow something that I will use later in life, I have just saved myself money and/or will have less work in the future. We will be going on a road trip vacation in a couple months, but unlike most, I will have our bags with us just in case. Jim, keep storing water. Don’t let anyone discourage you from doing so. As my spouse continues to remind me….What happened to our vacations and quiet evenings on the lake? I am constantly researching and building “stuff” for preparedness. I love the DIY stuff that requires no electricity to use. We keep buying one lottery ticket a week to hopefully win enough to buy the items we really need. There are just so many interesting Blogs and websites to read and learn stuff on.. I am relatively new to prepping and am reading everything I can to learn better, simpler ways to build a store of all that is needed to live through disasters, natural or man-made. My observations, however, of many prepper websites and blogs is that everyday life for so many preppers is being thrown aside in favor of just one more filtration system or a better way to start a fire under any circumstance. There seems to be a paranoia among a big number of folks inclined to prepare. I am concerned that these folks aren’t living their day-to-day lives in favor of prepping for tomorrow. We should all be prepared, yes, and we should work to help our family, friends, and neighbors be prepared. But not at the expense of viewing every moment, every object, every experience as another prepping opportunity. The smugness of being prepared should never replace the joy of living. When the SHTF and we are all holed up in our safe places, it will be more comforting to recall our carefree days than to worry about why we didn’t buy 1 more candle. Be prepared, definitely, but live each day to the maximum. You won’t get a second shot at it not matter how well prepared you are. Imho, it is not possible to be enslaved to a habit or practice or to something that is psychologically or physically habit-forming. Slavery is something which is physically forced upon others. I read somewhere that there’s no such thing as “an addiction”. It’s a made-up construct and a cop-out. Until then, live and let live. I have lived the self reliable life as long as I can remember. My parents and grand parents taught me that this was everyday life being prepared. My life is full with friends and family. I am a 10 year member of the RHSociety and love all the friends I get to travel and play with. DH and I are hunters and avid gardeners.There is such a genuine pleasure doing things we like together. Do I plan to ever stop prepping…no not in this life! It does not consume my life…no! However it does enhance my life in teaching others that want to learn. Madgie, I’m guessing you meant, the Royal Horticultural Society? That was only page one. Hi Helot, I did mean the Red Hat Society. My membership with the (RHS) has been a source of great fun,travel and friendship in my life. In essence I was expressing myself as an avid prepper but with multiple interests outside the prepper life. Great thread and interesting replies! I guess I am fortunate that my hobbies and work all fit a prepping lifestyle. The part that is work is work, but I still enjoy it. The parts that are hobbies are most enjoyable of course. There are some hobbies that I don’t do as much because they don’t necessarily fit in with prepping, but I still do them when I want to. So I don’t think it’s an addiction, or I’m hoarding. It’s just an integral part of my life, and the security prepping brings gives me peace. I have in some sense been prepping for the last 35yrs. I moved out of the city, bought cows, chickens, gardening, and we can. I got serious about prepping 3 years ago. I have stockpiled enough food for all my kids and grandkids that should last for years. I have done a lot to make sure that we will be able to keep what we have if need be. It doesn’t consume my life, but I believe we really may need to use them someday. From solar flares. terrorist attacks, the economy, the dollar, natural disasters, and the increased usage worldwide of fossil fuels, that our chances of something happening is greater than 7-8%. We have insurance on our homes and cars. I believe this risk for me to have to use my preps is greater. Prepping does stay on my mind daily. There is a lot of peace in mind to know that you can survive and protect your family. The way the prices of groceries are going up each week, we are getting an edge on inflation. Wife and I have been preppers for a few years now and really enjoy the satisfaction and security our supplies and new knowledge give us. We are in our 60s and have five grandchildren age seven and younger (with one or two more likely to come). Much of our prepping now is done with their futures in mind. We want to be able to pass the stuff and know-how on to all of them. It helps that their parents are of the same mindset. It is interesting for us to look back over our lives and see how God has orchestrated the events to bring us to where we are today. He is our real source of satisfaction and security. I feel like it’s more of a state of mind or a way of life than any of those things, but that’s just me. My Dad and fellow family members think I’m addicted to prepping but I don’t think I am. For me, prepping is a hobby ( one of many ) and I like the idea of being as independent as possible. I try to balance my life with hobbies I enjoy ( just started a real raised bed garden last summer and have built another ) and playing guitar which is still just noise not music. :) I find that I tend to have several projects going at any one time. I set a goal for each project that day and if I get tired of that particular project I move onto another and revisit the project another day. Maybe I have ADD? I do enjoy just standing in my ” Prep Room ” and looking over all my stuff and wonder to myself if I’m missing anything then making a note if I have. Also prepping can be a great source of pride and well being. If I’m addicted to prepping it sure beats any other addiction I’m aware of. Personally i think it becomes a personal choice after a bit. – when i first started prepping, it was just after i quit my job and times got tough, i had to learn to do things differently to save money. buying things when i had a buck, cleaning out the clearance shelves when there was a bargain i couldn’t afford to pass up, learning to make thing by hand on the cheap to save money. ive been learning to do more thing naturally, learning homemaking skills that would come handy if the electricity went off due to not having the money to keep it on. could i cook food, would i be able to flush my toilet, would i be able to take a bath, things that would take importance should an emergency arrive. – that’s when i came across a prepping site, after dealing with many hippies, vegans, and another natural DIY sites. the preppers were my kind of people, and had more answers than those other sites. answers i longed for and needed. – Especially living in Florida watching a Hurricane outside my hotel window, you need survival skills i learned living in the Pennsylvania mountains on a back road with no groceries/ flat tire/20 miles out of town, In a small town in Nebraska with the fresh snow burying your house from a Blizzard, or watching a tornado on your back porch go through the next town picking up trains and houses like they were toys. I agree it is a personal choice and one I hope more people will make. Living through the different disasters that I have over my 60 years would not how been possible with preparing ahead. good luck in all your Prepping! Thank you for your very real insights, Kamiko. Until these things happen to you personally, it is easy to forget about the risks that are out there while just living your life normally. What a timely article, for me at least. I have been wondered, lately, if I am addicted to prepping. We are pretty new to prepping, maybe just over a year or so. We have a month’s worth of freeze dried meals for our family and I have reasonably well stocked pantry of about another 30+ days or so. I am trying a concept that instead of having a stockpile of food that is separate, just for an emergency, that our home is just well stocked and I constantly rotate items out of our pantry, replacing them with newer. I have a goal of 6 mo of food. Everyweek at the grocery store I try to buy a little bit extra, an extra canister of salt, grab 2 cans of pineapple instead of 1, etc, and it is working. Slow and steady wins the race. But sometimes I start panicking that we don’t have enough. A trip to Costco is sure to set me off. It is a good thing they don’t take credit cards. I would be in BIG trouble. I just got off the phone with my mom we are planning a big family vacation in the fall. There is a part of me that feels guilty about planning this trip and spending the money on that and then there is another part of me that says YES, do it! I view it as the difference between surviving and living. After 9/11 I had an airline ticket booked to fly home to see my parents and attend my 10 year HS reunion. My ticket, booked months prior, was for 3 days after they reopened the airports. My mother cried and begged for me not to get on the plane. She begged me to wait and fly with my husband, who was coming later in the week. I asked her what good will that do? She said it would just make her feel better. I wouldn’t because I told her that the terrorists win when they change our lives and make us afraid. I borded that plane and felt a small personal triumph. I have a bucket list which inclued things like walking as much as possible of the Great Wall of China, seeing Macchu Picchu, shopping in bizzars in India. I want to live not just survive. Gaye, this is why I love your blog. I love your advice about comfort items. I especially love your canning jars of M&Ms with oxygen absorbers. I disagree with the definition of hoarding…it’s acquiring ‘stuff’ with the thought it may come in useful ‘later.’ The hoarding starts as the person loses the ability to discern garbage from something useful. i.e. I save jars, but not every jar because I have goals for those I save. If/when the time comes and I can’t/don’t use or reuse those jars, then they are just stuff taking up space and w/o purpose. As human beings, we are all subject to any of these happening to us. It just takes the right trigger/event. So while some might believe me to be any one of these, that’s their perception. Their experiences aren’t the same as mine so what I do won’t necessarily fit for how they choose to live. I’ve been doing what I do long before I ever heard of prepping or hoarding. I prepare for the lean times during the fat times. I won’t say I am even partially prepared, for me, it’s an ongoing process. Since I rotate my stores, I regularly go camping and turn any opportunity like the loss of power or water as a chance to sharpen my skills, I couldn’t tell you what it’s called. I just accept it as a part of my life and keep my mind and body learning new skills and sharing what I know when someone asks. preparing for the worst should be an integral part of our life, we should practice being self-sufficient. ~gomowpropane. I’m showing my house right now to rent, and so it is impossible to hide how much food I have stored. Yesterday a prospective tenate turned to me and said, “Oh…you are Mormon, that’s it!” I smiled, “no, but I do believe as they do in being prepared.” My motto is trust God and prepare as best you are able! Gaye, does this mean you are moving off that island? If so, that shows me you are becoming more fearful of the future and that bug out site you were looking for, you have found. If you have decided on Ky, let me know and I will give you some rabbits and chickens. We did have a very high tech secondary location near Seattle which has now been sold and the money is in the bank. Although it was totally outfitted for survival, it was just too darn close to the woes of urban life. Plus, in taking my own advice, if someone is going to have a second location they can bug out to, it should be geographically away from the same disaster risks. As far as being fearful? Yes, that is true. I feel a bit impotent to control what happens in the future but can still be ready. My biggest problem is that my preps are woefully disorganized. Anyway, we are still planning to find a BOL aka “cabin”. Can I have some rabbits and chickens even if I do not move to KY? Perhaps in thought, right? OK, so your not moving but you are renting out your house, you must have more than one house on your island. That’s OK. One of my rabbits just had a few little ones. Do you want the all white, all black, or the black with white markings? I think you need the all white ones. Is that OK? Just one house. No renters. But we are seeking a cabin somewhere away from earthquake country. Preferably where the weather is more cooperative while gardening in the winter months. Alas, not as far away as Kentucky. When it comes to the rabbits, I am a-ok with your pick. This is virtual so send over some pictures. Is it okay to name them? Sure you can name them, but no “cotton” or “floppsie”. I’ll send pics when I am back from Front Sight. By the way. I received an email from Front Sight yesterday telling me we will have the opportunity to shoot the fully automatic weapon of our choice for $40 a magazine. When I told my grandson and his dad about this, they both (as me also) said to sign them up.